A delightful collection of entertaining songs in the tradition of Hank Williams, Cole Porter... or Warren Zevon! DuQuette's signature vocals and guitar are alternately supplemented by a tasty rhythm section, trumpet, mandolin and pedal steel. A classic. If you get the chance to see Lon live do not miss him. Songs delivered with wit, insight and love. He writes songs like stories that are so engaging you cannot help but be dragged smiling (and crying) into them. Lovely stuff. (Last Night I Dreamed Of Dead People, Roman Rider, I Wish I Were Krishna and Love's Song are the standout tracks for me). However, if you cannot see him live then this album is the next best thing. What a wonderful recording. There aren't enough stars to give it here. Songs about life, love, death and the bits in between! Lon DuQuette "The New Bob Dylan"
Although neither an accomplished singer nor an accomplished instrumentalist Mr. DuQuette is so significant in the depth of what he is expressing and saying (so well BTW) that being hailed as the” New Bob Dylan” is not an exaggeration. As a stylist he ranks alongside immortals like Dean Martin, Sinatra and Burl Ives. is so powerful and filled with “gravitas” that the hearing of that single track was worth the price of the CD and admission to the show. It will stay with you until you are old and grey. You may remember it on your death bed from 40 years ago. Charming entertaining and very musical, DuQuette, like Dylan, has little voice or guitar technique… but who cares? He has written some songs that are worthy to be included of the American songbook as Stephen Foster’s Jeannie with the Light Brown Hair, My Old Kentucky Home are part of our cultural legacy. Think Beatles class message writing. The Title track “I’m Baba Lon” is a classic and “I wish I were Krishna” encapsulates Hindu philosophy in verse and refrain par excellance. You’ve never heard anything like it. Finally an entertainer with something to say and the charisma to convey it. If you are looking for meaningless drivel do not buy this album but is you want something that will be in you CD bin until your grandsons an old geezer then it’s worth the nominal price. I guarantee you will play the CD over and over. The songs could easily last 100 years minimum. “Love me Slow” is a heartbreaker and a mystical trance all rolled into one. Lon DuQuette; Keep an ear out for him. I've been a fan since LON MILO DUQUETTE'S WHITE ALBUM and BLACK ALBUM. 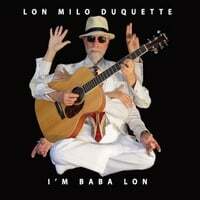 I'M BABA LON confirms for the third time that Lon Milo DuQuette is the Mark Twain of songwriting.